from the courtyard. Cohrssen photograph. Terrace and the garden beyond. Studios, 1904-1910. Blown glass; height 13 1/8, diameter 8 1/2 inches. 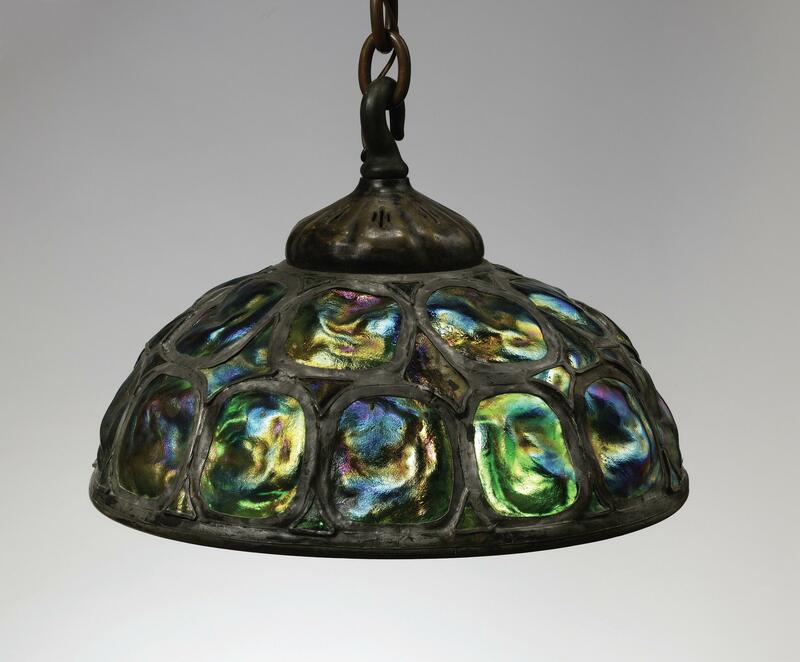 lamp by Tiffany Studios, c.
shade by Tiffany Studios, c.
Country Life in America, vol. 14 (August 1908), p. 366. Tiffany, whose father Charles Lewis Tiffany had founded Tiffany and Company, enjoyed a luxurious lifestyle distinctive even by late Victorian standards. In his New York apartment on East Twenty-Sixth Street, and in the fifty-seven-room grand house he designed for his extended family at Madison Avenue and East Seventy-Second Street, Tiffany surrounded himself with opulence-Chinese porcelains, Indian teakwood, Levantine carpets, tooled leather, beaten copper, hammered brasses, cast bronzes, osaics, tiles, and stained glass. Even in the black-and-white photography of his day Tiffany’s interiors shone with almost barbaric splendor, his decorative themes at once rooted in history yet arranged in an uncluttered manner prescient of future trends. If the neo-Romanesque architecture of that palatial New York house was the cutting edge if fashion in President Chester Arthur’s time (it was completed in 1885), the long horizontal massings, rows of fenestration, and shallow curved roofline of Laurelton Hall departed considerably from the usual Beaux Arts vocabulary of mansion building in Theodore Roosevelt’s day. Indeed, the roofline was dominated by a clock tower whose clean profile anticipated the structures designed for airport flight controllers in the 1940s. By the time Tiffany died in 1933, his Long Island pleasure dome seemed out of place in a streamlined era that dismissed his Belle Époch aesthetic. Although he had established a foundation to maintain the house as a museum and school for young artists, the Great Depression and the economics of the postwar period militated against his vision. Most of Laurelton’s contents were auctioned at Parke-Bernet in 1946 and two years later the property was subdivided to raise funds. In 1957 the house caught fire. Although the charred ruin remained a kind of dinosaur footprint, many of the stained-glass windows and other important architectural elements were salvaged by Hugh F. McKean, director of the Charles Hosmer Morse Museum of American Art in Winter Park, Florida. There they formed the world’s most comprehensive collection of Tiffany’s work. The museum, which effectively anchors the northern end of Park Avenue, WinterPark’s main street, in counterpoint to the lively campus of Rollins College at the southern end, was founded in 1942 by McKean’s wife, interior designer Jeannette Genius McKean, who named it after her grandfather Charles Hosmer Morse, a Chicago industrialist. In 1955 Jeannette McKean organized at the Morse the first serious exhibition of Tiffany’s work since the artist’s death. Hugh McKean’s connection to Tiffany was even more personal. As a young painter he had been selected by the Tiffany Foundation for a student residency at Laurelton Hall in 1930. There he and his colleagues worked under Tiffany’s benign critical eye, often joining the master for organ recitals in the house’s grand Fountain Court. This experience fired McKean with a desire to collect Tiffany’s work. After serving as chairman of the Rollins Art Department he became the college’s president, and when the Morse Museum was founded, he was appointed its first director, later writing the seminal reference work, The “Lost” Treasures of Louis Comfort Tiffany (1980). But before you have actually arrived in the reception hall you will probably be drawn to your right by one of Tiffany’s architectural showpieces, the reconstructed Daffodil Terrace, which is subtly canted at a diagonal from the perpendicular line of the passage.3 This design lends a refreshing sense of interior spaciousness to the rectangular terrace while giving visitors their first view of Tiffany’s rows of Carrara marble columns from a slight angle. Ruggiero notes that if the water theme in the entrance hall was derived from Moorish Spain and the Middle East, the Daffodil Terrace’s “integration of outside and inside space was similar to the ideas of Frank Lloyd Wright, who opened his studio just around the time that Tiffany was moving into Laurelton Hall.” To complete the decorative scheme, the museum is installing wicker furniture like that seen in period photographs. Visitors will thus be able to sit and gaze upward at the magnificent coffered ceiling, with its molded composite earthenware tiles and myriad stenciled cedar elements (some acquired by Tiffany in North Africa), and the central skylight lined with panels of iridescent-glass tiles. The stellar attractions here are the extraordinary capitals that lend the terrace its name. Tiffany designed them of cast concrete embedded with fully modeled glass daffodils on intertwining green glass stems. Their bouquet shape is vaguely Egyptian, but the effect is pure Tiffany. The blue and white dining room also creates a pleasing tension between past and present. The color scheme, with its Chinese inspired carpets, recalls Oriental blue-and-white porcelain, a color theme that was at the heart of the Anglo-Japanese aesthetic movement on which the young Tiffany had been nurtured. The stark marble mantelpiece and the leaded-glass inverted dome lighting fixture (an uncommon Tiffany shape) both look beyond the Wiener Werkstätte of their time to Walter Gropius’s Bauhaus, while the white-enameled dining set, with its octagonal table and cabriole-leg chairs, evokes the rococo dining set at which Prussia’s Frederick the Great used to conduct his intimate luncheons and suppers with Voltaire and other intellectuals at Sanssouci, his country palace. Running along the back wall, a clerestory of leaded glass “wisteria” transoms, salvaged from Laurelton Hall’s dining room, maintains the illusion of the outdoors inside. Back in the reception hall, the arrangement of leaded-glass panels, the original pendant lamp shade of blown glass, the displays of art glass vases in Islamic arches, and the central fountain all evoke Tiffany’s original Fountain Court. The fountain’s simulated water, now worked by a computerized projector beneath the floor, changes color continually. On a nearby wall, however, are the salvaged color wheels that Tiffany himself designed to achieve that effect mechanically in 1905. From these three daylight-filled galleries, you proceed to more subdued ones. In addition to its more public rooms, Laurelton Hall included numerous bedrooms and sitting rooms, a smoking room, and rooms specifically designed to house Tiffany’s various collections. Hence the new wing contains a gallery called “Other Rooms” installed with artworks and decorative pieces known to have been displayed around the great house. Among these are a collection of Islamic tiles (c. 1575-1650), and, dominating the room, the profoundly moving Tree of Life window, the very last designed by Tiffany, which he placed in his studio at Laurelton Hall. Dramatic as this gallery is, the Living Room gallery is even more so because it conveys a sense of the room as Tiffany knew it. Its central feature is a large T-shaped wooden desk reproducing Tiffany’s original. Overhead, five original bronze pendant lamps leaded with green turtleback-glass (two globes and three dome shades) hang from an exact replication of the original hammered-iron yoke fixture, which incorporated a number of antique Japanese tsubas (medallion-shaped sword guards) from Tiffany’s own collection. Flanking a massive pair of intricately carved Indian teakwood doors, are the leaded-glass Four Seasons window panels he designed for the Paris Exposition Universelle in 1900. This gallery also contains the beautiful Feeding the Flamingoes window (c. 1892), which capitalizes on the master’s ability to use glass not just for its color but for its texture-wavy glass for the undulating folds of the maiden’s gown, and glass acid-etched on the reverse to achieve the effect of water spouting in the fountain. Nearby hangs Tiffany’s original watercolor of the scene. Other Tiffany canvases hang next door, among them the Winslow Homeresque My Family at Somesville (1888), the impressionistic Peonies and Iris (1915), and his most ambitious tableau, Flora (Spring) (c. 1887-1898), showing a procession of nymphs paying homage to the enthroned Roman goddess of flowers. With its frieze-like arrangement of classically draped figures and its riot of flowers and blossoming cherry trees, Flora combines the petal-strewn textures of Sir Lawrence Alma-Tadema’s 1888 painting The Roses of Heliogabalus with the bucolic pageantry of Frederic Lord Leighton’s The Daphnephoria of 1876. Painting was always closest to Tiffany’s heart, and as a young man he had declined to join the family business in favor of pursuing art studies in Europe. Eventually he was elected to memberships in the National Academy of Design and the American Society of Painters in Water Color and was a founding member of the Society of American Artists. Yet, for all his love of painting, one must admit that Tiffany’s draftsmanship lacked the solid academic finesse of a Leighton while his brushwork falls short of the virtuosity of a Claude Monet or John Singer Sargent. But if his paintings did not reach that pinnacle, his painter’s eye for color and composition formed the wellspring of his decorative pursuits. Posterity can therefore rejoice that Tiffany channeled so much of his painterly energy toward his true genius. And every gallery of the Morse Museum’s new wing reveals this with vivacious clarity.